When is a loyalty program membership card not really a membership card? And when are a loyalty program’s rewards redeemed as a separate currency on an entirely different product and product category? Answer to Question #1: Membership cards take on a new meaning when they are actually consumers’ own credit and debit cards, pre-linked to a multi-partner rewards program. With each swipe of the linked card at any of the coalition’s participating merchants, consumers’ point-of-sale rewards are automatically deposited into a cumulative account. Answer to Question #2: The currency in these joint CLO-coalition loyalty programs materializes as rewards-based savings on gasoline and fuel. Specifically, members earn rewards from a coalition of merchants at the point of sale, and then redeem them as cents-off-per-gallon savings at another point of sale when they fuel up at the pumps of participating gas stations. The coming together of card-linked offers and coalition loyalty, particularly in the U.S., is a sign of loyalty’s evolution in the marketplace. According to the Colloquy 2015 Loyalty Census, U.S. loyalty programs now have 3.3 billion members and growing membership rates, up 26% from 2013-2014. The average U.S. household, however, belongs to almost 29 rewards programs but is active in only 12 – a 42% (and dropping) participation rate. Consumers often say they lose interest in rewards programs because tracking rewards is difficult, earning rewards takes too long or is too cumbersome, or because the rewards they receive in exchange for their patronage are not valuable, relevant or timely. As retailers and merchants consider launching, upgrading or modernizing their loyalty programs, some are turning to card-linked offers, the power of a retailer coalition, and the attraction of a frequency-based rewards commodity like fuel to attract consumers eager for timely, easy-to-redeem rewards that delivery everyday value. Coalition loyalty is particularly attractive for retailers interested in rewards programs that do not require huge investments in IT, integration and set-up, or sole retailer ownership of marketing. One of the first and longest-operating coalition loyalty programs in the U.S. is the Fuel Rewards® program, which offers cents-off-per-gallon savings as the universal reward, provides the underlying platform and handles integration, IT support, marketing support and advertising services for merchants. With card-linking as the underlying payment method, the Fuel Rewards® program tracks the earn-accumulation-redemption metrics of the program. In effect, the loyalty program serves as the operational platform, and merchants’ primary responsibilities are to decide whether to join, ensure back-end-systems are compatible for vendor set-up and integration, agree on participation parameters and fees, and welcome customers who come through the door. Once the process is in place, the data stream and IT capabilities of a CLO-supported platform deliver the strength of coalition in a plug-and-play format. The underlying platform manages all consumer and technology touchpoints, including customer relationship management activities (CRM), consumer sign-up, membership, tracking and redemption. The very nature of the coalition also offers piggybacked brand awareness and extensive cross-marketing opportunities with other merchant members, not to mention the increased activity, engagement and sales that result. And results? Data shows that up to 75% of consumers who earn fuel savings rewards are likely to redeem them within 20 days of earning them – more than double the 35% average redemption rate noted by Forrester among general loyalty programs. Fuel savings rewards are also the preferred discount option for saving on fuel, according to the Association for Convenience & Fuel Retailing, whose annual report notes that 43% of consumers use a loyalty card or app loyalty card by almost a 2-1 ratio over other discount propositions to save on gasoline. A recent U.S. survey by Ipsos eNation, sponsored by Excentus Corp, found that fuel savings rewards are the top-ranked loyalty incentive among all consumers – preferred (37%) over cash-back (32%), retailer/brand coupons (25%), credit-card rewards and instant cash-register discounts (24%, tie), airline miles (17%) and hotel points (16%). And even though Millennials rank fuel savings rewards (25%) nearly equally with cash-back (26%) and instant coupons (23%), the influential 18-34-year-old demographic is more willing than older consumers to switch retailers, brands and grocers if switching enables them to earn rewards to save on gasoline. By rates up to 20% higher than older generations, in fact, they tend to be more loyal to the discount than to brands or retailers. Retailers who offer fuel savings rewards can benefit from the frequent earn-and-burn cycle and repeat business inherent in a reward that consumers can use regularly, frequently and as part of their everyday shopping driving routines. Retailers also benefit from the data that emerges from card-linking and coalition relationships. Because customers choose to enroll their credit or debit card in a coalition loyalty-based CLO, retail partners can leverage consumers’ opted-in status and the mobile channel to send push notifications, email communications, text messages and other communications to program members in real time. They can deliver incentives and promotions that are personalized, relevant and timely – the key foundations of effective mobile marketing. Partners can also benefit from the real-time mobile data that results, allowing them to measure campaign effectiveness and shopper-to-buyer conversions, for example, and transforming them from passive affiliates to active CLO-framework participants. A coalition framework also solves many of the challenges of standalone loyalty programs. Partners can enjoy repeat business and increased frequency from existing and new members; according to BIAKelsey, repeat customers spend 67% more than new customers. Coalition retailers can pursue re-engagement and spending from lapsed members. They can benefit from more reasonable card-transaction commission fees, greater access to rich transactional data from shoppers’ activities, and the shared reputation and visibility that comes from the association and cross-marketing opportunities with other coalition members and well-known brands. Consumers also benefit from CLO capabilities within a coalition loyalty framework. Consumers’ payment cards, in effect, because a seamless membership key that supports regular interactions with partners and frequent opportunities to earn rewards. They can earn fuel savings rewards as they patronize grocers, pharmacies, home improvement stores, sporting goods stores, online commerce sites, pet stores and others. Likewise, the rewards they earn can be turned around quickly and redeemed as a universal currency on an everyday commodity –gasoline. No more waiting months or years to earn enough airlines miles or hotel points to take a family trip. No more small-increment build-ups toward unreasonable redemption goals and milestones. 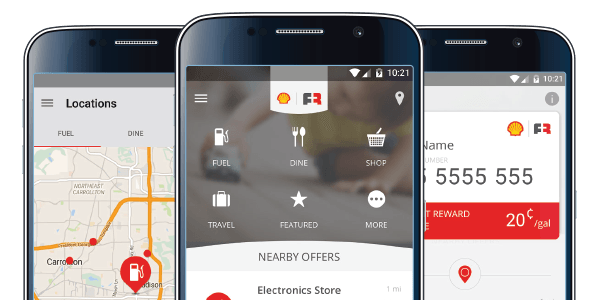 Fuel savings rewards are earned and tracked easily simply by swiping a credit or debit card, with redemption handled at the pump, either by membership number, mobile app or card swipe as well. And when rewards are tied directly to the use of their credit cards and tracked by mobile apps, members no longer have to search for specific offers or “click it to get it.” As opted-in members they are eligible to receive marketing offers sent directly to them, offers that are data-informed by their CLO transactions, preferences, activities, loyalty status, purchase histories and other metrics. The simultaneous marketplace shift toward mobile payments and digital wallets also matches consumers’ habits, preferences and the ever-present utility of their smartphones. With their rewards CLO-enabled, information can be automatically stored in their digital wallets (Apple Pay, Android Pay, Samsung Pay and the like). They can carry fewer plastic loyalty membership cards, or in some instances, can earn both retailer-specific and fuel-savings rewards from the same point-of-sale purchase. With data tracked and stored by card interactions or on mobile devices, they can forego website logins and call-center interactions for tracking their rewards, redemption and status. From their ever-present smartphones, they can interact with a coalition loyalty program simply by swiping, tapping or scanning to pay, earn, track and redeem. Card-linked loyalty creates a compelling opportunity for retailers and consumers alike in today’s commercial marketplace. Key trends deliver compounded benefits for retailers and merchants who are looking for loyalty programs that deliver more customers, more sales, more engagement and deeper loyalty to the brand. These trends encompass the gradual move toward a “cashless” economy for point-of-sale purchases; consumers’ rapid and expanding embrace of smartphones and mobile devices for payments, communications and shopping; and the allure of a reward based on an everyday commodity and a universal currency: fuel.